Big Fish is a visual delight, and it’s not too bad on the ears, either. 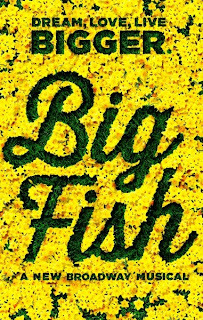 Coming to Broadway after a run in Chicago, Big Fish is a musical adaptation of the eponymous novel, by Daniel Wallace, and film, written by John August. August further adapts Wallace’s book by writing the musical’s book, and is joined by songwriter Andrew Lippa. The results, directed and choreographed by Susan Stroman, are mostly glorious, giving audiences a splashy, fantastical and heart warming big Broadway musical. 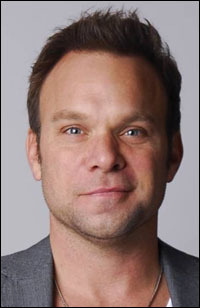 The story centers on Edward Bloom (Norbert Leo Butz), a man who spends his life telling mythic tales. 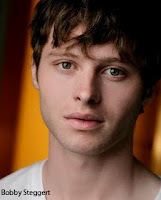 His son, Will (Bobby Steggert), doesn’t believe a word out of Edward’s mouth. Now in his late twenties, just married and about to have a child, Will is urged by his mother, Sandra (Kate Baldwin), and wife, Josephine (Krystal Joy Brown), to reconcile with his father, and actually listen to the stories, to learn who his father is. This means that the creative team had to find a way to balance the “present day” pathos with the fantasies Edward tells. They missed the mark only slightly, and the heart and ending of the second act make up for the few false moves made in act one. Steggert does nice work in the thankless role of the straight man, and his naturalism helps to ground the show, even when Will gets caught up in his father’s tall tales. Those tall tales sometimes seems to come out of nowhere, and are totally ridiculous—but that’s the point. No matter how implausible Edward’s stories are, like Will, we’re meant to glean lessons from them; they’re fables, essentially, and are not supposed to be taken literally. Implausible or not, those fantasies look and sound amazing on stage. Bravo to the entire design team, who had to create about 17 different worlds to go along with each of Edward’s tales. (I think Will counts 36 basic stories that his father has told various versions of over the years; obviously we don’t see all of them.) The projection design by Benjamin Percy for 59 Productions blends seamlessly with Julian Crouch’s scenic design and Donald Holder’s lighting design. They are complemented by Tony Award winner William Ivey Long (Cinderella)’s glorious costumes. 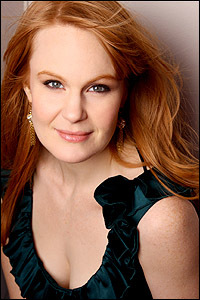 (Wait until you see the stunning Kate Baldwin in the blue satin dress at the top of act two.) These are distinct worlds Edward purports to have been a part of, worlds that include a cave wherein he encounters a giant (Ryan Andes), a circus, a spooky forest that introduces him to a fortune-telling witch (Ciara Renee) and so much more. The entire design team worked together under Stroman’s vision to bring these worlds to beautiful, vivid life. Much praise must be given to Stroman (The Scottsboro Boys, For the Love of Duke) for her vision. It would be easy for the show to get out of control. Edward’s imagination and penchant for elaborate storytelling knows no boundaries. With no boundaries, anything is possible and sometimes directors and other storytellers fall victim to that, losing focus and letting the show run amok. Luckily, the terrific Stroman reigns in Edward’s blooming imagination, and she also features several choreographic languages, a real help in distinguishing settings. She is well matched by the immensely talented Norbert Leo Butz, a two-time Tony Award winner (for Dirty Rotten Scoundrels and Catch Me if You Can) who is so utterly charming on stage that you can’t help but fall for all his myths. I predict Butz will garner yet another Astaire Award for his footwork here. Butz has repeatedly said in interviews that he is not a dancer; he does a damn good job of faking it. Watch for him to open the show with a bang with the "Alabama Stomp," a dance the fanciful Edward makes up to teach a man to fish. But that’s not all. Butz is a good singer and a gifted actor. Here he is romantic without being schmaltzy. His Edward is a dreamer, and you can’t help believing in his dreams. Big Fish is a big show. Edward’s stories are epics, and the production value doesn’t skimp. From a wealth of colorful costumes to an actual giant, from the glorious kinds of big song and dance numbers you don’t get anymore to Edward’s hopes for his family, Edward Bloom dreamed bigger and lived bigger, and so does this show. To learn more about Big Fish and to purchase tickets, visit bigfishthemusical.com.